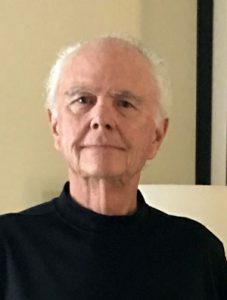 SKINNERSVILLE — Arnold G. Tolson, Jr. transitioned to be with The Lord February 6, 2019 at his Skinnersville, NC home after a lengthy illness. He was the son of the late Arnold and Inez Tolson Sr. of Manteo, NC. Arnold was 76. Arnold was raised in Manteo, NC where he developed into an expert waterman. He fished commercially and captained his own charter boat known at the Sea Whisperer for many years out of Oregon Inlet. Besides the fishing industry Arnold also developed and managed mobile home communities. Through those ventures he met and married his soul mate Deborah and the two embarked to Idaho where they grew a successful mobile home development business. Arnold and Deborah also used their gifts to establish a thriving non-denominational outreach ministry which changed hundreds of lives and saved countless souls. Arnold’s love of animals led him raise, train, and handle award-winning champion Labradors both domestically and throughout western Canada. In recent years, the Lord guided Arnold and Deborah back to North Carolina. They continued working in developing successful mobile home communities and growing closer in their walk with Jesus. Though his earth suit has been left behind, Arnold lives on totally healed, in complete peace, and in full restoration with his creator, Jesus. Left to celebrate and honor Arnold Tolson, JR. is his wife nearly 30 years Deborah of the Skinnersville, NC residence; his five children, Bull, Inez, Melinda, Rachael, and Natalie; his two brothers, Bobby and Dean; his six grandchildren, and one, great-grandchild as well as numerous friends and colleagues in Idaho and North Carolina. A memorial service will be held at the Gallop Funeral Chapel in Nags Head, Sunday, March 3, at 2 p.m. Pastor Deborah Tolson will officiate.